This is the first year of having a garden and I’ve been growing a lot of zucchinis and have been tryingto find new recipes. As a pasta lover and always hearing about zucchini noodles, I decided to give it a try without going out and buying the Spiralizer. It turned out very good and I decided to share with you the steps to easily make the Zucchini noodles! 1. 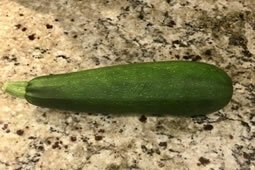 Pick out your zucchini and rinse it. 3. 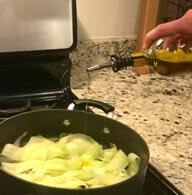 Add about 1-2 tablespoons of olive oil and cook on stovetop at medium heat. 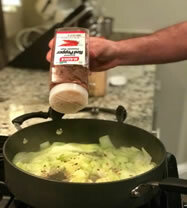 If you love spicy, you can add some red pepper flakes! 2. 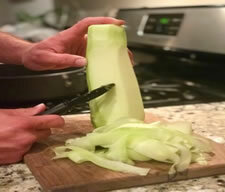 Use a handheld slicer to peel away thin slices of the zucchini. 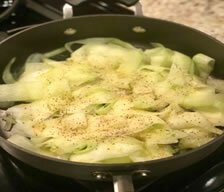 4.Add your favorite seasonings; here i added about a tablespoon of ground pepper and garlic powder. 5. 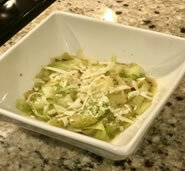 After about 5 – 10 minutes, take off the stove and serve with pasta sauce, meat &/or Parmesan cheese, as seen here, and enjoy!